A couple of weeks ago I wrote about a man who had a huge American following but was very overlooked in the UK, this week it’s a similar story. You’ll know songs by this man especially if you’ve seen the films Tootsie, National Lampoon’s Animal House and White Nights. Not only has he contributed songs for films but he’s acted in a few too. His name is Stephen Bishop and the song in question this week is On and On. Bishop was born Earl Stephen Bishop in San Diego, California in 1951 and at school learned the clarinet. It was after seeing the Beatles on the Ed Sullivan show that he decided he wanted to be a musician and persuaded his brother to buy him a guitar. Once he got that guitar and learned how to play it he formed a band called The Weeds. He also began writing songs and after he’d moved to Los Angeles he landed himself a job at a song publishers earning $50 a week. In 1974 he got a deal with ABC records, he explained how that happened, “I was friends with a guy named Richard Holland, who was going out with Chaka Khan. Chaka’s manager, Bob Ellis, was interested in me, and he’s the one who got me my deal with ABC. Roy Halee, the producer of Simon & Garfunkel, signed me to ABC. He released his first album, Careless, in 1976 which made the US top 40 and was certified Gold. The first track released from it was On and On. It featured Andrew Gold on guitar and reached number 11 on the Billboard Singles chart. Bishop has said that he wrote from titles usually and explained in an interview with Songfacts how On and On came about, “My landlady back then used to put lots of flowers in her garden from all over the world. She was a big flower lady so she would tell me where all these flowers were from. Back then I hadn’t travelled anywhere so I was really fascinated by that. And then I was walking down the street to the corner grocery store in Silverlake where I was living at the time and I just got the idea for the title. I just wrote it down on my little message book. When I went back to my apartment, I came up with this chord that I just loved. Then I just kept playing it over and over and I finally did something with it, and made On and On.” It never charted in the UK for Bishop, however a cover version by Aswad reached number 25 in 1989. Bishop recorded, but didn’t write, It Might Be You which is the memorable track from the Dustin Hoffman & Jessica Lange 1983 film Tootsie. It was actually written by Dave Grusin and Alan & Marilyn Bergman. In early 1985 he recorded an album called Sleeping with Girls which was only released in Hong Kong, but on it was a track called Separate Lives that Bishop wrote about his own past romantic liaisons which appealed to Taylor Hackford, the director of an up and coming film called White Nights. 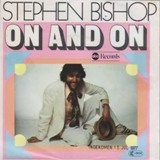 Bishop did not intend it to be a duet, but Hackford suggested it and it was covered by Phil Collins and Marilyn Martin. Not only has Bishop written and recorded songs for films, he has made some appearances too; his first was in 1977 in The Kentucky Fried Movie where he was billed as Charming Guy then as Charming Guy with Guitar the following year in Animal House. In 1980 eagle-eyed viewers would have spotted him as Charming Trooper in The Blues Brothers and his final ‘charming’ appearance came in 1983 when he was billed as Charming G.I. in Twilight Zone: The Movie. As a songwriter, numerous singers including Eric Clapton, Barbra Streisand, Yvonne Elliman, Kenny Loggins, Johnny Mathis, Helen Reddy, Stephanie Mills, Frida (from Abba) and the Four Tops, have covered his songs. Stephen is still recording and released his last album, Blueprint in 2016. This year he has contributed two tracks to two different films, you’ll hear Animal House in the film A Futile and Stupid Gesture and Almost Home which is performed by Dewain Whitmore, Jr. in the film about an orphaned puppy called Benji. He continues to tour saying, a couple of years ago, “I do a lot of stuff overseas; they usually pay really good. I went to Belfast to do some concerts. Over the years I’ve been to the Philippines 10 times, Japan eight times. I’ve been to Dublin six times, England three or four times, plus Argentina three times. So I’ve been all over the place.